The only day I need to set my alarm clock is Saturday night for church on Sunday morning. Every other day Sadie gets me up before 8:00 am and I don't feel the need to get up any earlier then that. Well, I always set my alarm on Saturday night for around 7:00 am (just in case Sadie decides to sleep in) and I always regret it on Sunday morning. Of course the snooze button gets slapped and even though I stay in bed until 7:15 or so, I'm still upset at myself for thinking that I would want to get up that early! Getting up early is much easier said then done! Does anyone else get a little too ambitious when setting their alarm clock? I have an alarm clock that sleeps with me every night! He goes off at 5:00 a.m. every day and once I am awake the rest is history!! I have learned to love the early wee hours of the morning and must say I get alot done! I have an alarm clock, but I wake up before it goes off every day so it doesn't do any good. It is more just for a "just in case" situation. I used to sleep in until about 8 or 8:30 every morning, but ever since I started working at 6:30 a.m. (about 3 years now), I can't seem to sleep in past 6:00 a.m., even on the weekends. Sad, huh? I happened upon your blog while looking for ThermaSilk...not that it hugely matters, but I am in the same boat, and just NOW realized how yucky it is. I just thought perhaps my little town was "out" of it and would be getting more in, you would think after two months of looking for it I would have come on here sooner!! Thanks for keeping up on the blog!! You need to get the RiteAlarm clock which is the only alarm clock that have triple alarms for Weekdays, Saturday and Sunday. With it, you can set a weekly alarm only for Sunday, and disable the Saturday alarm. 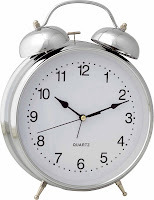 Mr. Alarm Clock (see immediate preceding comment) might wish to re-read the post. Anyway, I am proud to be the awaker of Little Miss Wee Hours of the Morning (see first comment above). And I wake her so QUIETLY! Considering that the last time I set my alarm was for 5:30 PM, I would not consider myself ambitious when it comes to setting clocks. I am the complete opposite of ambitious. I am not a morning person either and hate any kind of sound before noon. I usually use my alarm to remind me of things I have to do like go to my painting class, or to a concert. This makes me laugh. Brooks always sets the alarm way too early. We get to bed around 1am and he thinks that he will be able to get up at 7am. He usually hits the snooze button for 2 hours. We have gotten into many arguments over this!